hi friends what's your day? today I wanted to tell you a fascination about me that in reality very few people know, I do not remember exactly how it came to her but it was something like this, it turns out that I have a cousin who always listened to Korean music, she was in love with many Koreans and consider them beautiful, from my point of view I see them all very similar haha ​​but in the end that is not the issue. It turns out that one day I approached him and asked him what it was called one of the many songs he listened to, which to say the truth was somewhat sticky and so I gradually introduced myself to this culture. I started looking for many songs and one thing led to the other ... I ended up in the movies. I have commented to my closest friends that they see one or another movie but in fact they have not listened to me, now I comment to all of you: my beautiful community !! I can personally catalog the following films as the best of this type, I think they are full of a 100% sincere feeling, with unusual stories and that within their simplicity make them extremely unique and cute. 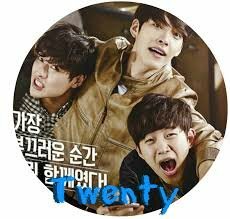 TWENTY: the story of 3 best friends, who make a pact to always be together about all things, and as in all teenage history has a womanizer, a nerd (scholar) and a loser. in the story each actor has his own leading role and his love .. is full of funny moments, they talk about many things without censorship but do not worry about anything out of the ordinary, also about the development, your first love and the value of the feelings. CHILLING ROMANCE: is a perfect combination between love and fear, it is a girl who has never had a boyfriend since she is a medium and ghosts harass her and especially one who wants her to be a ghost in life, she in history she knows a brave, loving and crazy magician who is willing to face all fears in order to be with her, but as he gets closer he realizes that things are not only saying them but also doing them. she, on the other hand, is a very lonely girl, to the point that her entire family is millions of miles from her, she only has two friends that she almost never sees, they only talk because they live with the fear that the ghost also harasses them. ALWAYS ONLY YOU: It's a beautiful story based on a young man who is an Ex-Boxer, one day a beautiful girl confuses him with an old man and gives him all kinds of food this is so because she can not see but this is not an impediment to make love grow everything starts when every night she returns to listen to her favorite novel with him, the clear, is always waiting for her but as the story passes she suffers an unpleasant situation, loses her job and that is when he returns to boxing in order to sustain it and this situation leads from one thing to another to the point that he finds out that if she does not operate she will lose her sight forever, and of course, he looks for any possible method to save her ... TRUTH IS A BEAUTIFUL HISTORY OF LOVE. Undoubtedly these are not ALL are also: Old Boy, Sympathy for Mr Vengeance, I saw the Devil, Sympathy for Lady Vengeance.